R1X is rated 3.7 out of 5 by 3. Rated 1 out of 5 by mipete from R1X CONDITION AND REPLACEMENT * I Purchased a R1X from Steiner paying the $50. more to buy it from Steiner. * Received 10 days Later. * Dot was blurred and had a light to the right on single and Triple. * Controls did not work. * Returned product * 25 days after I returned it I and told I am approved to receive a new one, which will ship in 20 days. Start to finish 55 days. If I receive a working R1X. I was told by Steiner they only check 1 in a 100 ?? I pay less for a lot of products that have better quality control than that. Rated 5 out of 5 by CWOGMJ from Mounts In the Tech support there was a question asking if the cam lock mount was sold separate . It is available from Optics planet as I purchased one . Rated 5 out of 5 by choppinbroccoli from My favorite Optic!!! I have to say that I absolutely love this optic!! Glass and red dot are top notch. I love the look and the fact that is doesn't take up much rail space. This thing is built like a tank!!! Battery life could be a little better but similar to Eotech. I have one on each of my guns!!!!!!! What is the MOA of the dot size? 2 MOA for the center dot 4.1 MOA for the three drop-dots. The non-QD version comes with a riser so as to see above my OTAL-C. &nbsp;Is it possible to use two of the risers for an even higher mount? &nbsp; ..... if so is there a specific part number to order from you guys? Hello, It unfortunately will not work as there are no screws to accommodate two risers. 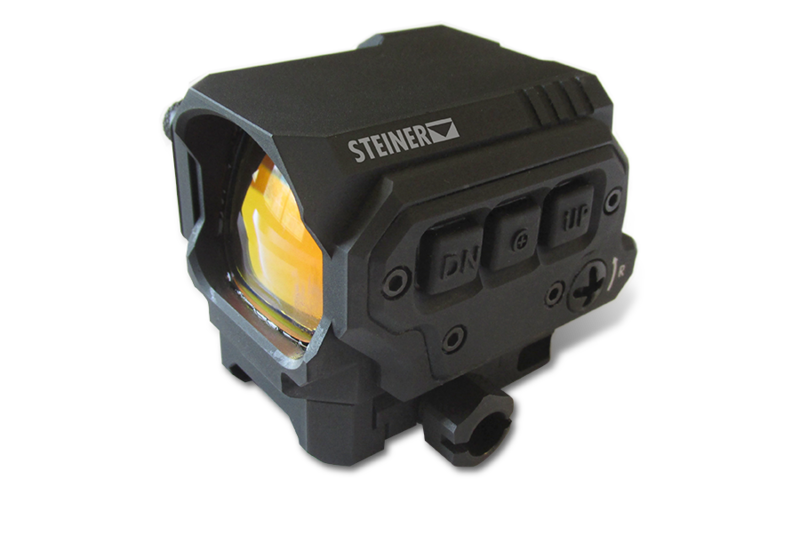 is there a laser from Steiner that will attach to the side of the R1X and is the R1X-L discontinued? The R1X-L has been cancelled. I am not aware of a laser that will mount to the R1X. When will the R1X-L be released? The R1X-L has been cancelled, there will not be a laser version. It is rated to 10M for 120 Min per ISO 9022-82-01.
will the r1x fit on top of the m536, if yes are there any photos of this combo? Hello, As per the specs, it is 9.6 oz. Yes that would be fine. We recoil rate and engineer them to beyond .50BMG in both directions. Actually, that goes for all of our optics!